Wine Label Information: Which Label is the Front Label? Which wine label is actually the front label? You will be surprised by the answer! 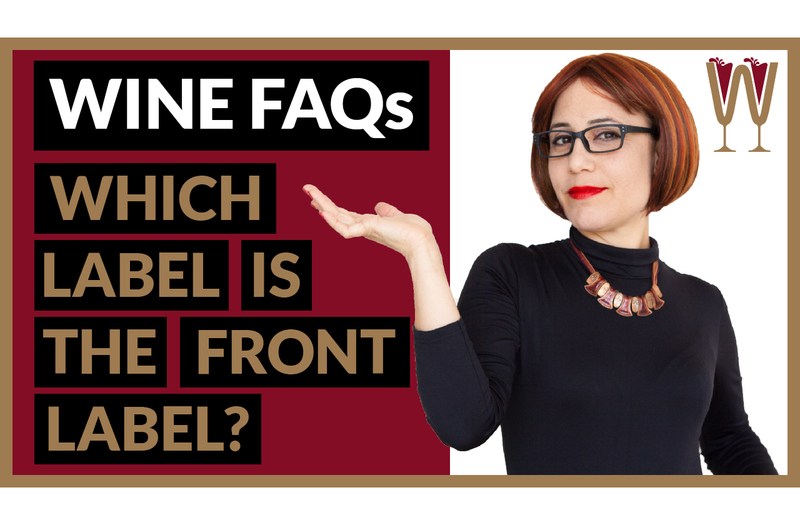 In today’s video Annabelle McVine discusses wine label information, wine label rules and wine label laws. More fascinating Wine FAQs from WineScribble. And stick around for the extra trivia about wine label design. WineScribble explores the humble wine label. A WineScribble fan sent me a private message on Twitter two days ago asking: Why are there two labels on my wine bottle? That is a fabulous question thanks for raising this point Jose. I can’t wait to provide some clarity for you. Make sure you stick around for some fun facts about topsy-turvy wine label display as well as a bonus bit of trivia about what it takes to make it as a wine label designer. Hey Tasters this is Annabelle McVine. Welcome to the WineScribble YouTube channel. The home of wine applied. So wine bottles have two labels. One at the front and one at the back. Or do they? Well the thing about cylindrical objects is that they don’t actually have a front and a back side. However there are usually two stickers on the bottle and they face opposite directions. So which of the two stickers should you be looking at? Here are three points that are worth bearing in mind. The direction the wine merchant chooses to display your wine is not regulated by the law. So of the two labels the merchant will choose to display the one most likely to drive sales. Unsurprisingly this is the one that has been specifically designed to catch the eye of the wine lover. If I am trying to persuade you to buy my wine, I’m more likely to use a pencil sketch of an idyllic Chateau, than the address of the bottler. The label of the merchant chooses to display feels good and looks good. It’s colourful, dramatic poetic and eye catching. But… is this actually the front label? The label that the merchant displays is designed to catch your interest visually, rather than tell you anything of substance. Instead the salient information has all been squashed together onto the smaller of the two labels. This information includes the brand, the alcohol content, the name and address of the bottler, as well as other mandatory legal information. So which of the two labels is the front label? Regulatory bodies the world over are notoriously indifferent to anyone’s attempts at individual artistic expression so the artwork and logo and decorative touches on the larger of two labels are of no consequence to them. According to the law the front wine label has to be the one that contains all of the salient information. So the front label legally and the front label commercially are on opposite sides of the bottle. This does not mean the wine merchants are being deceptive. Pay attention to the commercial front label of the bottle you’re holding. You will realise that a good wine label designer tries to capture the character of the wine in a single image and one or two words. By the way we have put the ultimate guide to wine for beginners, which thoroughly addresses everything you need to know when you first start exploring the world of wine. If you want to know more click on the link in the description below. Also, I have left a link to another video in which we compare an old-world style Sauvignon Blanc from France to a new world style one from New Zealand. Find out how they compare by clicking on the link in the description below. So are you ready for my bonus bit of trivia? Did you know that being a graphic designer alone is not enough to secure a job as a wine label designer. In order to become successful wine label designer an in-depth knowledge of wine itself is essential. As well as understanding its history, regions, industry, and tasting profiles. The best wine label designers take specialisation courses in order to excel in the field. I would love to hear the questions you have about wine leave them in the comment section below. Share them on social media. Or send them via email. I love reading them and make sure you go to our Wine FAQs YouTube playlist for videos that address questions about wine, that you have asked! So Tasters, if you have enjoyed this video please hit the like button below. To let us know that you want us to continue making these videos remember to also share them with your friends. Subscribe to our YouTube channel now and remember. Those who drink get drunk, those who taste feel sublime. I will see you on the next video! You know this isn’t a Chateau, right? This is in Italy. I’m holding a Chianti.